This brown rice recipe is so easy to make and is delicious! Quick, healthy and inexpensive. Ingredients: Brown Rice, Kidney Beans, Roasted Brussel Sprouts with Elephant Garlic, Roma Tomato, Avocado. Brown Rice: Start with 2 cups of brown rice and 4 1/4 of water. I like to add a tablespoon of organic, cold pressed coconut oil to the mix. Now, just wait for the rice cooker to do it’s magic. Brussel Sprouts (Roasted Brussel Sprouts with Elephant Garlic): While the rice is cooking, trim the brussel sprouts as needed then quarter on the axis of the stalk. Added quartered brussel sprouts to a mixing bowl. Then, take one elephant garlic clove and slice thinly. Add sliced garlic to brussel sprouts and toss with 2-3 tablespoons of olive oil. Olive oil amount will vary with quantity of brussel sprouts. I tend to keep the coatings light. Spread the brussel sprout onto a cooking sheet. Line cooking sheet with wax paper or foil for easier cleanup. On my oven, I set the roast temperature to the lowest setting. Cook until the brussel sprouts until the reach your desired level of roasting. Kidney Beans: Use can kidney beans or make your own from scratch. If you use canned kidney beans, rinse thoroughly. Roma Tomatoes: Clean and Rinse, dice to desired size. Avocado: Cut an avocado in half and scoop out with a spoon. Remove any brown spots from the avocado. In a bowl, add a layer of brown rice and simply top with kidney beans, diced tomatoes, brussel sprouts, and half an avocado serve. Separate the leftovers into tupperware for healthy, inexpensive work lunches. 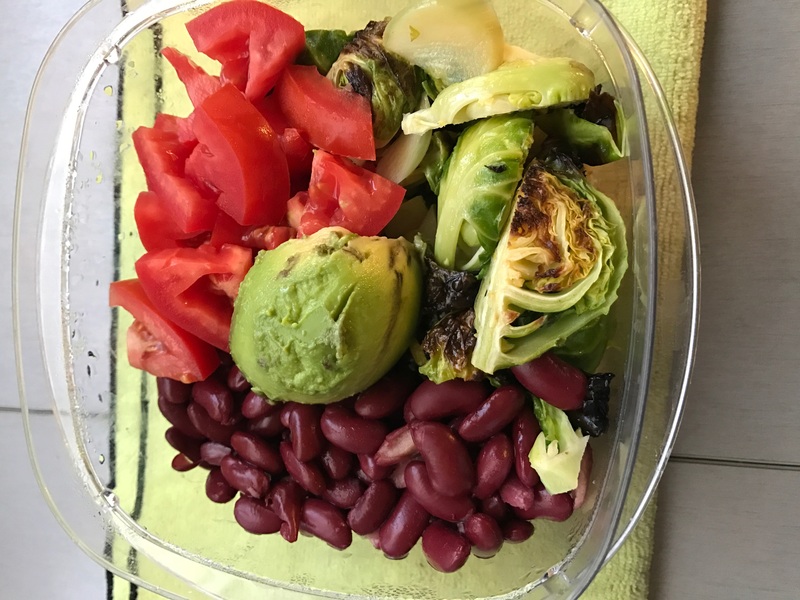 This entry was posted in Recipes and tagged Avocado, Brown Rice, Brussel Sprouts, Elephant Garlic, Garlic, Kidney Beans, Roasted Brussel Sprouts, Roasted Brussle Sprouts with Garlic, Tomatoes on December 20, 2016 by Jason Hennessey.